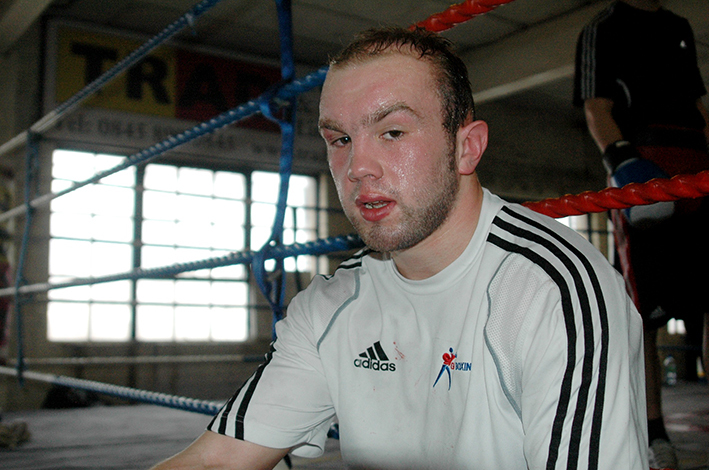 Iain Weaver Interview: Talks Pro Debut, Luke Campbell, Guillermo Rigondeaux, Vasyl Lomachenko etc. This coming Saturday one of the UK’s top amateur stars, European Silver and Commonwealth Boxing Championships Gold medalist, Iain Weaver makes his long awaited professional debut at York Hall in London. Back in July last year Iain was on the verge of hitting the big time, pro boxing wise, promoter Eddie Hearn had convinced him to sign with his Matchroom Sport concern with the promise of debuting on his September Alexandra Palace mega event, headlined by Darren Barker’s return. However this failed to materialize, due to the British Boxing Board of Control refusing to license him after his brain scan highlighted a cyst. Various appeals followed after independent neurosurgeons cleared him as fit to box, as the cyst was genetic, had been there all his life and presented virtually no danger to his health. One of the neurosurgeons even stated, that during his career he had only seen one similar type of cyst bleed, and that was due to the person received major trauma after being involved in a serious road accident. Even though Iain had enjoyed ‘elite’ status as an Amateur, fought 115 times and represented his country at the highest level with the cyst, as well as having various top neurosurgeons clear him, the BBBofC still refused to license him. Earlier this year Iain successfully applied for a Spanish license, however as soon as it was announced, that he would be fighting in London on the 27th,the BBBofC successfully lobbied the European Boxing Union to assist in persuading the Spanish Federation to revoke the license. Never one to give up, Iain successfully applied to a different European sanctioning organization for a professional license and finally makes his professional debut at York Hall in London this coming Saturday. I met up with Iain at the TRAD TKO Boxing Gym in Canning Town as he finalized his preparations for his long awaited pro debut. Initially I had asked Iain about the ongoing saga, it had only been a few days earlier that he had been informed that he has been successful in his latest license application, but it was clear that the 23 year old from Ferndale in Dorset felt uncomfortable discussing the whole sorry affair, much preferring to talk boxing in general. Rio: Finally you get to pro debut this Saturday at York Hall, it’s been a bit of a drama getting here but now you are, so how do you feel with your first fight being just a few days away? Iain: Yeah, I think it’s great, I can’t wait to get into the ring. It’s been a long time coming, the 27th can’t come quick enough though. Rio: You’ve had a great amateur career, what would you say are the highlights of your career? Iain: I think the highlights were really the European Silver medal and the Commonwealth Games, I won the Commonwealth Youth Games and the Commonwealth Seniors, that was a great experience for me. It was really special to be a part of them and you know traveling the World with all the other GB lads was a great four years of my life. Rio: The transition from Amateur to Pro is not always an easy move, how have you coped with the different areas in making the move? Iain: To be honest, I’ve always had a bit of a pro style anyway. I’ve always suited the pros better, I always started slow in the amateurs and tended to lose the first round and got stronger as the fight goes on. I think doing more rounds will suit me better. I’m really looking forward to my debut as I feel I should have been fighting pro much earlier. If I hadn’t been on the Olympic squad and had a chance of going to London 2012 I probably would have switched earlier. Rio: Since you bought up the Olympics, your nemesis Luke Campbell is turning pro with Matchroom Sport, so in the near future we could have ‘Groves-DeGale’ type of showdown between you two again, this time on the pro circuit. Iain: Definitely, he suited the amateurs, he was hard to beat, he was a good kid for the weight, three threes suited him, but the pros are a different ball game and I think it’ll suit me more than it’ll suit him. Rio: I’m going to stick with the amateurs – in your opinion who has been the standout amateur boxer, past or present? Iain: To be honest it’s either (Guillermo) Rigondeaux from Cuba or Lomanchenko from the Ukraine. I’ve been in tournaments with Vasyl Lomachenko and I’ve seen him first hand and he is a very special talent. After watching Rigondeaux the other weekend and watching videos of him in the amateurs, I’ve got to say he’s probably one of the best amateurs ever as well as a World class pro. He’s a southpaw and he’s quick, I watch him and try and get tips so I can do things that he does. Rio: I Know Rigondeaux is already in the pros and a unified World Champion, but that aside who are your favourite pro boxers? Iain: Yeah, but Rigondeaux’s got to be right up there, but when I first started making my move to the pros my coach said I reminded him of Pernell Whitaker. I didn’t really know too much about him, didn’t know who he was, so I looked him up on YouTube and that’s the style I like, the style I like to fight at. Yeah, Pernell Whitaker is probably my favourite one. Oh and I was born on the same day as Muhammad Ali, so he’s one of my favourites also. Rio: Thank you for taking some time out from your preparations to talk with me and good luck on the 27th, although I’m sure you don’t need it. Iain: No problem, I’d like to say to your readers, it’s going to be a great show, there’s even a big title fight headlining. It’s not on TV, so the only way to see this is get down to York Hall on Saturday. Iain Weaver will be making his debut, against a yet to be named opponent, on the undercard of the Oisin Fagan versus Chris Goodwin WBF Inter-Continental Lightweight title clash, that headlines Dave Murphy’s Thunderdrome Promotions ‘Thunder & Lightning’ event at York Hall, Bethnal Green in London on the 27th April 2013. Tickets, priced £65 (Ringside), £35 (Floor) and £30 (Balcony) are available on-line at www.tkoboxoffice.com or in person from Iain himself or alternatively at the TRAD TKO Boxing Gym in Canning Town, London E16 4SA - www.tkoboxinggym.com - or the Ringtone Gym in Euston, London NW1 2PB - www.ringtonehealthandfitness.com - Tel: 07960 850645 or 07557 641597 for further information.